Genesis Streets of Rage 3 (USA) in 38:12.55 by atro city. In part three of the Streets of Rage series, Mr. X is back and this time his plan involves replacing public officials with his own robots. Only Axel, Blaze, Skate, and newcomer Dr. Zan can stop him. 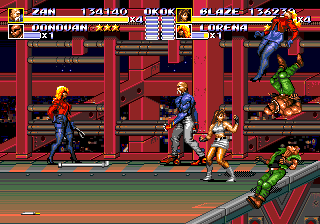 Streets of Rage 3 features all of the beat 'em up action you would expect from a Streets of Rage game. One new feature is the special move power bar, where it only costs energy to do a special move if the bar isn't full. Also new is the ability to do special maneuvers with different weapons, depending on the character. For example, Skate has no special move with the pipe, but he does have one with the knife. The opposite is true for Axel. Any weapon Dr. Zan picks up is turned into energy balls which he can throw at the enemies. Secret characters and multiple endings also add replay value. In this run, watch atro city stylishly dispose of a lot of thugs and robots using Blaze and Dr. Zan, clearing a long game in only about 38 minutes. A glitch is used which does damage much more quickly when two characters attack multiple enemies at the same time. For more details, read the submission comments.